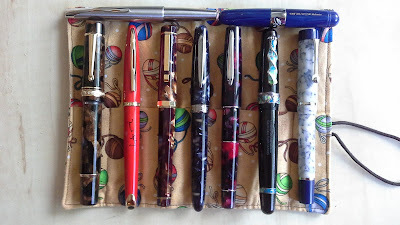 Continuing with our June theme of "Limited Edition Fountain Pens"...here are some photos of a few of Bruce's amazing Visconti LEs. The one on the far left (in the photo below) is the gorgeous Visconti Mudejar Art LE, made of ivory-coloured resin and covered in scrimshaw engravings, released in 2007 (only 600 made), the one in the middle is the Visconti Istos Aracnis, released in 2012, made of black lucite and covered with a Sterling Silver overlay in a web pattern (only 888 made), and the far right one is a Visconti Ripple LE made for Chatterley Luxury. 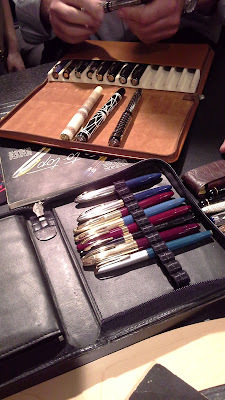 Excellent info on Visconti's Limited Edition Pens (they made a lot of them!) 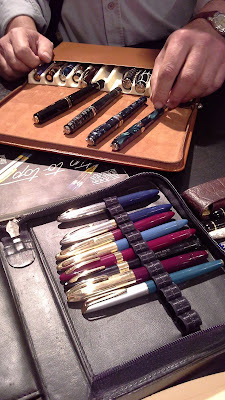 here on Fountain Pen Hospital's website. An assortment of wonderful Visconti LE's from their Opera range - from L to R: Opera Master LE, a Wall Street LE (2nd gen), the Aida LE, and the Visconti Opera Club Maple Leaf LE. 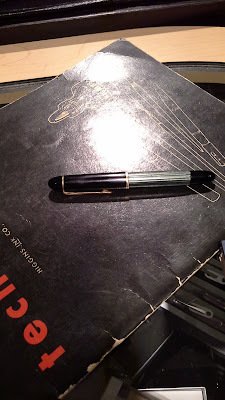 A quick shot of Stuart's newest acquisition----a green-striped vintage Pelikan 140, a piston-filler made from 1952 to 1965. 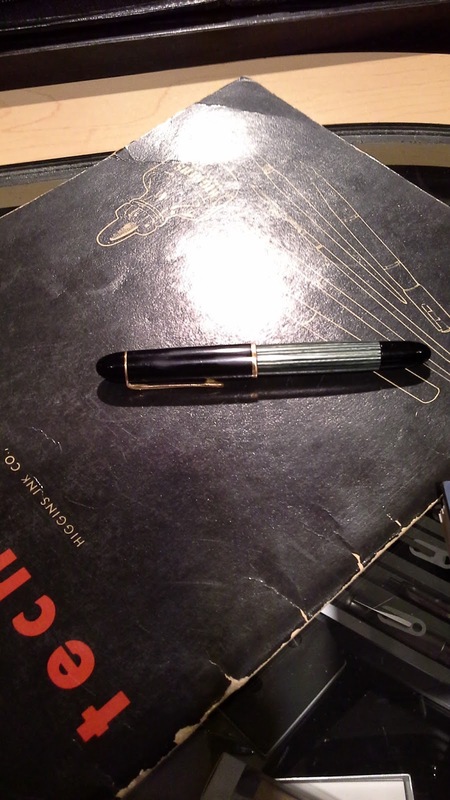 Those old Pelikan gold nibs usually write really nicely (as an aside, I have a 140 with a fantastic oblique medium nib that I absolutely love using). 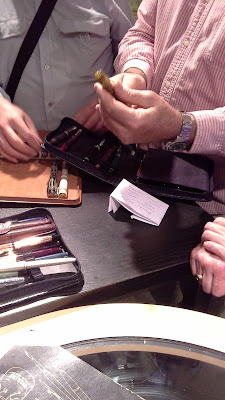 Lastly, I asked Ben to take a photo of his two modern Sheaffer Balance LEs because I accidentally deleted a quick shot I took of them, and he sent me this great photo showing the Jungle Green LE on the left and the Aspen LE on the right. 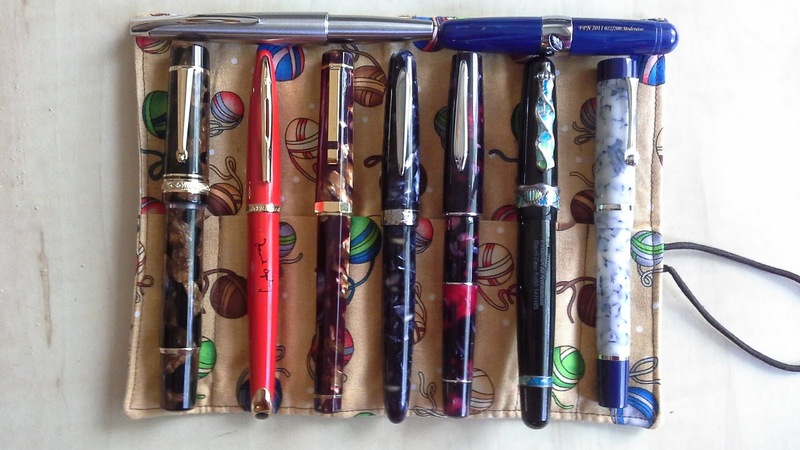 Both are stunning patterns! And many thanks to those members who brought in their new aquistions (not photographed)----June with her Pelikan 400NN, Bart with his Pelikan M800 in Burnt Orange, Natasha with her Marlen Aleph, Lamy Safari in the Dark Lilac colour for 2016, Lamy 2000 in stainless steel and her Namisu Nova model, which I believe was part of a Kickstarter.com campaign. 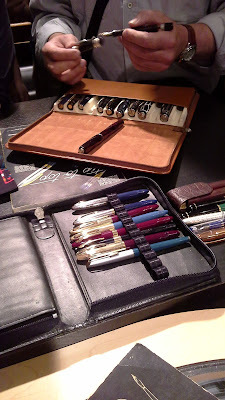 This is a simple but very elegant design, made from solid aluminum or titanium, which is now (unfortunately) sold out, but if you can get your hands on one, I'm sure you'll be impressed by the design. 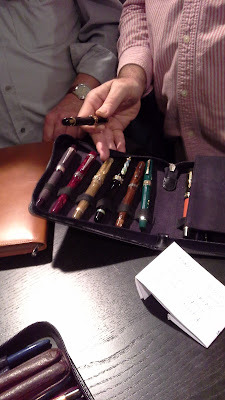 One of Bethany's two newest acquisitions brought in for us to see was a Tactile Turn 'Gist' fountain pen, another elegently designed pen that was also part of a Kickstarter campain (the other pen she brought was a very cool Franklin Christoph '65'). 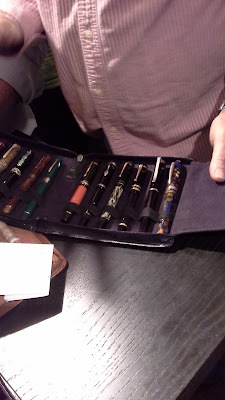 And last but not least, our generous door prize donor, Jerred brought in his newest pen purchases---a Stipula Etruria Magnifica, a Parker 180 and some Dollar 7171I fountain pens.